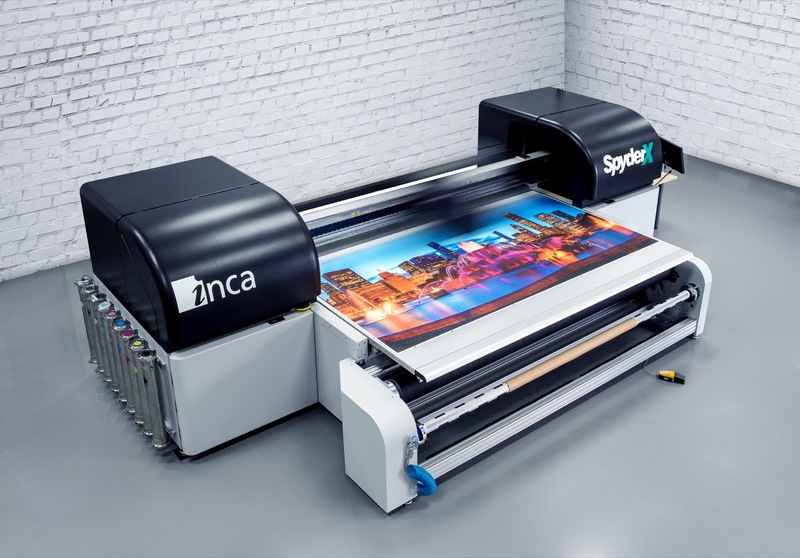 Designed and manufactured by Inca Digital, the SpyderX, distributed exclusively in North America by Fujifilm, allows for production of a wide variety of high-quality output. Utilizing Fujifilm Uvijet XS ink, developed specifically for the SpyderX, it delivers high-speed production up to 2,476 square feet per hour (230 square meters per hour) with pinpoint accuracy. Color Ink continuously seeks out and invests in the newest technologies to provide their clientele with solutions tailor made for a modern marketing era. SpyderX opens the door to application expansion or short-run specialty work support for print service providers. The robust 126” (3.2 m) wide, six-color plus white SpyderX is available as either a flatbed or a combination flatbed/roll system model, for handling rigid and flexible substrates, including PVC sheets, foam board, corrugated, polystyrene, window cling, wallpaper and banner material. “Previously we’ve had to turn down work, and now we are able to turn jobs quicker with the additional capacity of the SpyderX,” said Todd. The SpyderX is a powerful and versatile press capable of producing a wide range of high quality output from menu boards to banners to back lit signs and permanent indoor displays. “We use a variety of substrates, rigid and flexible, and having the assurance that the vacuum bed is going to hold the substrate down, without a lot of thought, is very important,” says Todd. “We looked at other hybrid options, and with regard to holding down the sheets, the vacuum performance on the SpyderX is great,” said Austin. SpyderX features light inks (Light Cyan and Light Magenta) in the standard channel configuration, enabling the production of finished prints with smooth tones and gradients while still printing at remarkable speeds. Increased efficiencies are enhancing the bottom-line at Color Ink, as versatility and speed are key elements within the high end SpyderX platform. With more than 30 years of trade experience under their belt, Color Ink’s business model has evolved far beyond commercial print. Over the years the company began to realize that in order to provide their nationwide and local customer base with the tools they need to enhance their brand, the company had to offer turn-key print and marketing solutions. From design to production to distribution, its staff of industry professionals has the vision and expertise to maximize client’s advertising dollar. Experience the SpyderX at SGIA Expo 2018, in Fujifilm booth # 1119.